Hi, I'm Penny. I’m adopted! Penny was adopted October 2016! Hi! My name is Penny. 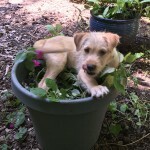 I’m a 4 month old terrier mix. I was found wandering stray with my mom and 5 siblings, and ended up at the PG county shelter. PGSPCA rescued me from the shelter along with my brother, Woody. We’re loving our foster home in Maryland. We’ve got space to run around, other dogs to play with, 3 square meals a day, extra treats for cuteness and a soft bed for naps. We get to play, eat, play, sleep, play, snuggle – oh and did I mention play? You see I’m a very active playful pup. You can see from one of the pictures that I like to garden. My foster mom says I’m not really that helpful but I keep trying. 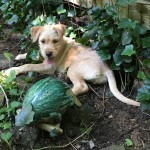 I need a forever home that has a big, fenced -in yard so I can run and play. I would like a family who is active and likes to take me for walks and jogs. I can’t be left alone for more than four hours since I’m so young and still working on house-training. I am working on being patient in my crate. 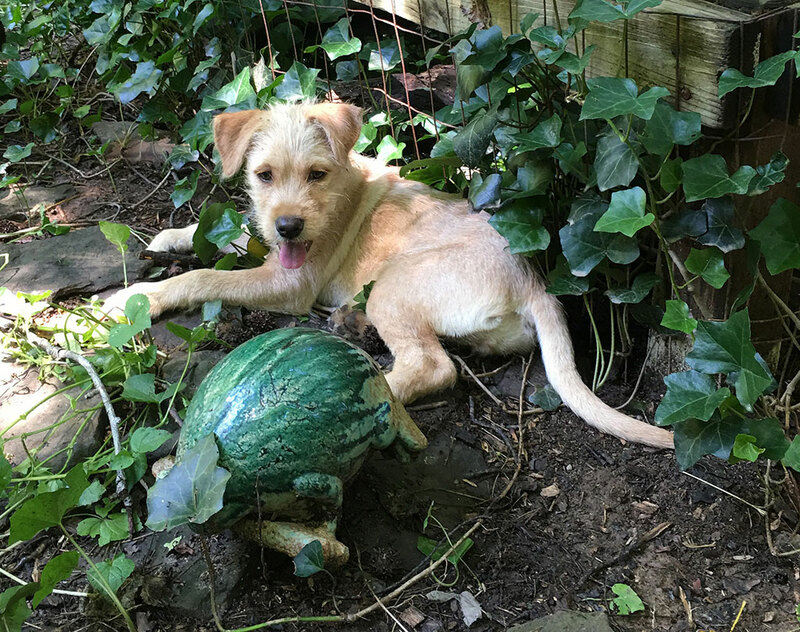 My foster momma says I listen really well (except when gardening) and I’m smart as a whip. I’m working on my puppy manners – only chewing my chew things and not jumping up. I like it when my humans smile and say “good puppy”. If you think you can give me the home I need I’d love to make you smile too! If you are interested in Penny. I’m adopted!, consider letting us know by filling out a (no-obligation) adoption application. Please consult our Adoption FAQ before contacting us. 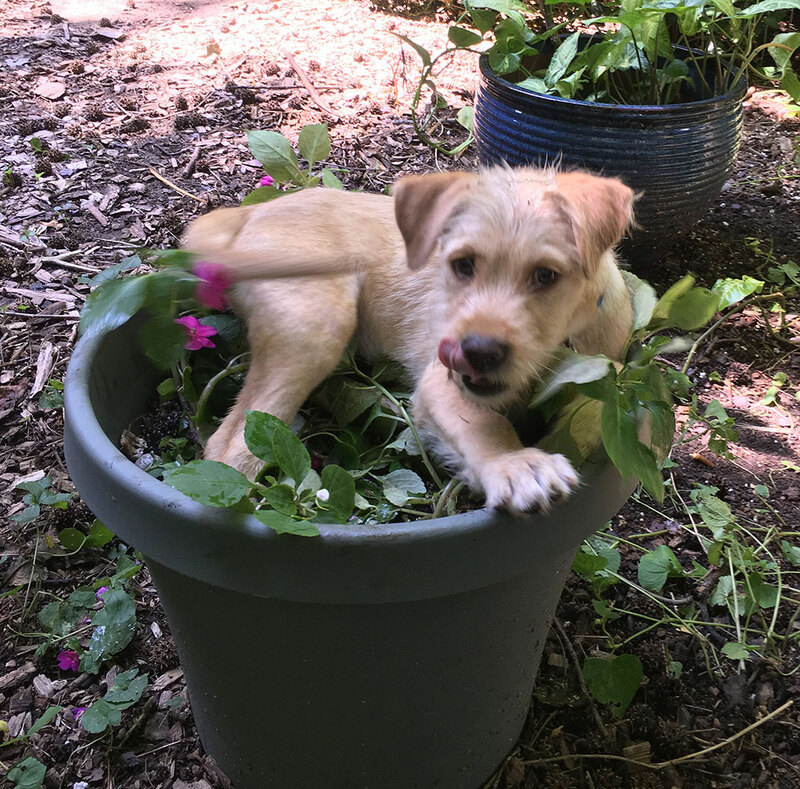 Penny is expected to attend the next adoption show, September 24th at the Bowie PetSmart , although there is always a chance that plans may need to change at the last minute.